Mulholland ~ "An olfactive immersion in the golden mythical era of psychedelia and hipness of the canyon of dreams. Notes of citrus, petit gran. [sic] oriental chord, crystalline musk." Taormine ~ "An escale in Sicily, a genuinely summer fragrance with a slight feminine accent. Delicious simplicity. Notes of Sicilian petitgrain, Calabrian bergamot, Italian citron, bitter almond, aromatic chord, crystalline musk." Les Nuits d'Izu ~ "Shimmery lights along the Izu peninsula, the Riviera of Japan, set against the indigo summer sky. Ethereal, precious. Notes of yuzu, rose japonica, littoral moss, hinoki, vanilla." Tarifa ~ "A journey along the Mediterranean crest that provides an endless source of inspiration and olfactive expressions. Quintessential and vibrant. Notes of Tunisian orange blossom, petitgrain. Calabrian bergamot, spices, vanilla, crystalline musk." Much as I love my Eaux de Cologne, these aren’t exciting me. I haven’t had much luck with KM fumes. Might still sniff the Le Nuits d’Izu if only to see what a yuzu cologne has to offer. I like a few of them very much…but wish they’d slow down. Nine new fragrances in 2 years is too many, IMHO. One really fabulous cologne would interest me more than 4 ok ones, and that’s usually how it turns out with these multi-releases. Agreed, Robin. I still haven’t worked my way through the last quartet KM released last year… These do sound great for summer, however. Looks like the Tom Ford Musk Collection. 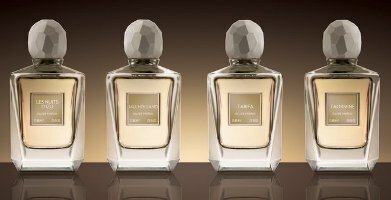 Hmm… a few fragrances inspired by Serge Lutens; bottles inspired by Tom Ford…. Bela: When you say fragrances inspired by SL, do you mean these, or the previous (grammatically incorrect) Datura Blanche (and/or others)? The bottle doesn’t bother me so much or seem so derivative. Some years ago, people felt that many of the KM line were variations on things in the SL line (this was a common topic of conversation on several of the fragrance boards). Sorry for the delay. Yes, I was referring to all those fragrances people said were very similar to SL’s. The names were similar too. I’ve never actually tried any of hers. I was thinking that the only thing that appealed to me about them was the bottles, but you’re right. “psychedelia and hipness of the canyon of dreams”??? I like Peau de Peche, and also Bois de Santal although it’s pointless as a sandalwood fragrance. Favorite (and only one I own) is Osmanthus. maybe its just me, but i tried Cuir Cordoba last weekend, and i dont smell any leather in it. Taormine and Tarifa sound interesting to me – I’ve been meaning to explore this line at some point. I’m still looking for my HG summer scent…. I might have to sniff the Mulholland- I have a bit of strange weakness for things that smell like I could have been a Doors groupie. That doesn’t read very well! I mean to say that I quite like ‘hippy’ fragrances as long as the patchouli, if there, is done well. These could be nice, but I think I’ve sampled but one of the last four. Agree with everyone about too much product! Two new fragrances per year is barely manageable; four is too many. I have become smitten by her Ume recently, though, and still really would like to try Oliban. Not sure what littoral moss is botanically, but presumably it’s moss that grows near water, as opposed to tree moss which is what is usually meant by moss in perfume. No idea what rosa japonica is. I found rose japonica on the net. Does it smell like regular roses? Now I have to go look up the moss. Oops, sorry that link doesn’t seem to work. The story was about two elderly people who had a garden with moss in it that smelled just like weed (cannabis). mulholland write up is hilarious and I’d try it just because I find it humorous. I’ve lived with a lotta hippies and most of the time the smell like hummus BO or natural oils but never ‘crystalline musk’. sounds uber-idealized.